Located in Cairns Central Business District, this hotel is within a 5-minute walk of The Cultural Place and Cairns Night Markets. Cairns Esplanade and Esplanade Lagoon are also within 10 minutes. Cairns Station is 14 minutes by foot. 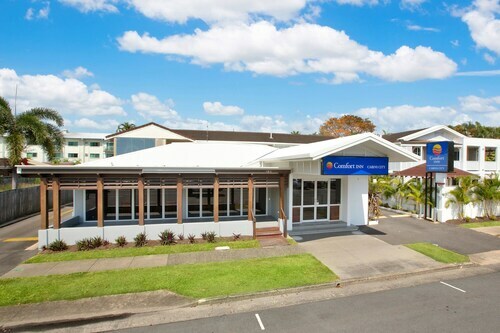 Located in the heart of Cairns, this motel is within a 10-minute walk of Cairns Base Hospital and Cairns Esplanade. Reef Fleet Terminal is 1 mi (1.6 km) away. Cairns Station is 20 minutes by foot. 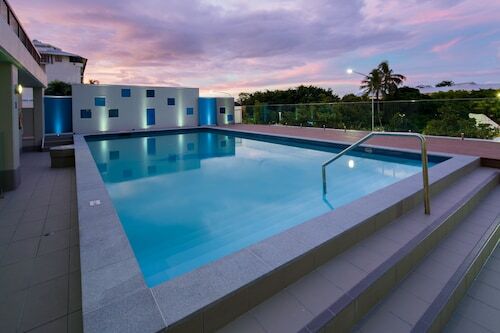 Located in Cairns Central Business District, this motel is within a 10-minute walk of Cairns Aquarium, Cairns Esplanade, and Cairns Night Markets. Esplanade Lagoon and Reef Fleet Terminal are also within 1 mi (2 km). Cairns Station is 18 minutes by foot. Situated near the beach, this hostel is within a 10-minute walk of Muddy's Playground, Cairns Esplanade, and Esplanade Lagoon. Cairns Night Markets and Cairns Marlin Marina are also within 15 minutes. Cairns Station is 23 minutes by foot. 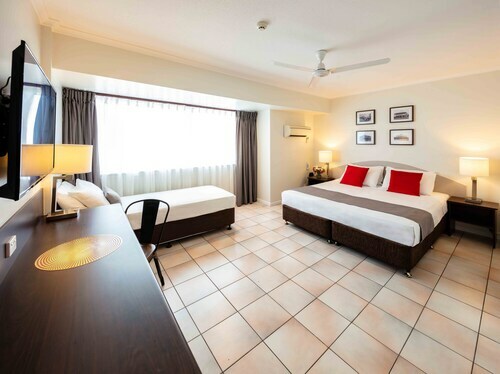 Nestled along Trinity Inlet, this Cairns hotel is a 5-minute walk from the Cairns Convention Center and a 10-minute walk from the city center. The Great Barrier Reef is within easy reach. 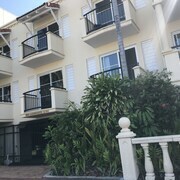 A one-block walk from the Esplanade and from the departure terminal for the Barrier Reef, the hotel is also less than five minutes' walk from Cairns' shopping, entertainment, and restaurant district. Tucked against the east coast of Far North Queensland, the city of Cairns is a mix of tropical beauty and urban landscapes. The bustling streets of downtown give way to the sprawling beaches that line the Coral Sea, and you’re itching to experience it all. There’s also the Great Barrier Reef lying just offshore, as well as Mount Whitfield Conservation Park just east of town. But before you go, you’ve got to book Cairns accommodation from Wotif. Where else are you going to sleep at night? How do I get to Cairns from the airport? That’s a good question. Lucky for you, we have the answer. 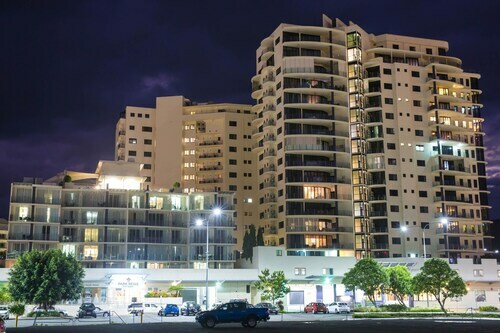 Once you land at Cairns Airport (CNS), 7km from the city centre, you can either take a taxi, a bus or book car hire in order to make your way from CNS to the city centre. Simple as that. What kind of hotels are in Cairns? There’s all sorts of hotels in Cairns. From boutique to luxury, follow along below for some of our favourites. Mantra Trilogy: This great apartment hotel is located on the waterfront Esplanade, and offers panoramic views of the Coral Sea. There’s also an on-site gym, a lagoon pool and barbecue pits so you and your mates can throw as many shrimps on the barbie as you want. If you don’t feel like cooking for yourself, grab a meal at one of the two on-site restaurants or just order up some room service. Shangri-La Hotel: How do you spell luxury? 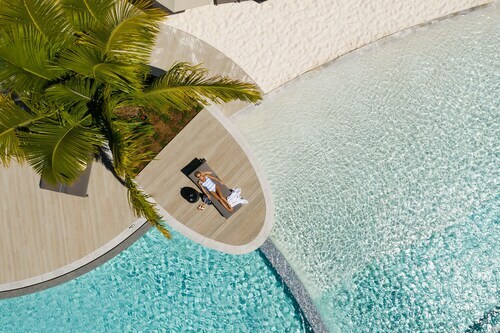 Shangri-La Hotel Cairns is how. This grand establishment is located right on the marina, so the views from your balcony will be nothing short of spectacular. The amenities here seem endless; you can work up a sweat in the health club, get a rubdown at the spa, and get a steak and lobster meal delivered right to your room. And when you’re ready for some sun, hang by the pool and enjoy a few Victoria Bitters. 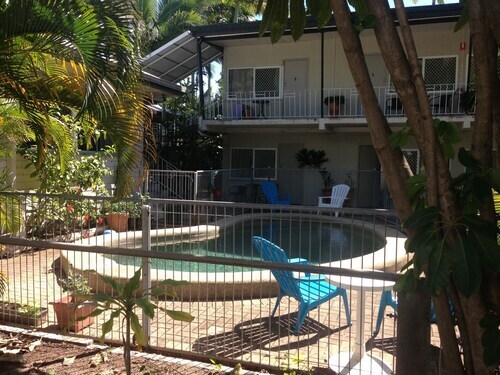 Waterfront Backpackers Hostel: If you’re looking for accommodation in Cairns that’s on the lighter side of the price range, this is it. Located directly on the Esplanade, this traditional hostel is perfect for putting your feet up at the end of a long day while sipping a cold one. Where should I stay if I’m visiting Cairns? Hey, we don’t mind all the questions—we have all the answers. Especially when the questions are about little enclaves throughout the city, like Parramatta Park, where the Cairns Central Shopping Centre is. Then you got Cairns North where the Ocean World Seafood Market is located. And don’t forget about Bungalow, where there are even more bars than people. These neighbourhoods are all home to great places to stay in Cairns. Check them out below. 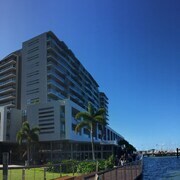 North Cove Waterfront Suites: Cairns North. What are some things to do in Cairns? The number of things you can do on Cairns holidays is absurd. There’s too many to count, so we made a short list of things you must do when you’re visiting. The Great Barrier Reef: No one likes when people beat around the bush: This by far is the biggest attraction in the area. Get yourself a spot on one of the many dive charter companies and spend the day exploring the world’s largest coral reef system. This natural wonder is too incredible to describe, so we won’t even try. We’ll leave that part to you. Cairns Wildlife Dome: You can’t go to Cairns without cuddling a koala. But there aren’t just koala encounters here—wait until they bring out the wallabies. The Cute-O-Metre will skyrocket right through the roof of that glass dome overhead…well, assuming it dodges the tropical birds like lorikeets and cockatoos that fly around freely. Rafting on the Tully River: RnR White Water Rafting will take you on an unforgettable journey down one of Australia’s best and most famous rivers. Those water log rides at amusement parks can’t hold a candle to these rapids. 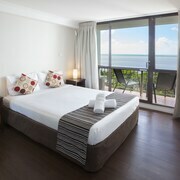 You’ll rest easy in one of our Cairns hotels after a wet and wild day. Have we rambled on enough? We think we have. Now it’s time for you to take advantage of one of Wotif’s Cairns hotel deals and get going on your holiday now. Seriously, leave now! And if you want to see the land of Tasmanian devils, check out the deals on our Hobart accommodation and make the five-hour flight south. Trust us, it’s worth it. How Much is a Hotel Room in Cairns? 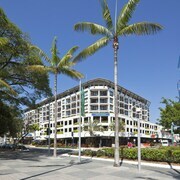 Hotels in Cairns start at AU$114 per night. Prices and availability subject to change. Additional terms may apply.